Fabulously presented three bedroom bungalow; with plentiful gardens overlooking green fields. EPC rating D. DESCRIPTION A bungalow with this sort of garden is rare; Jana occupies a really decent plot and over looks green fields. The current vendor has clearly poured her heart and soul into Jana, presented beautifully throughout this bungalow is neutrally decorated with splashes of colour and bursting with quality. It's been a home from start to finish and the next owners will surely love the space. The hallway, which is wide enough to facilitate a staircase should anyone wish to go up into the loft and add more accommodation, is light and airy. The sitting room with double doors to the patio at the rear is a decent size and has feature fireplace for gas fire which is on the external wall and may offer purchasers the option to add a wood burner instead subject to relevant checks. 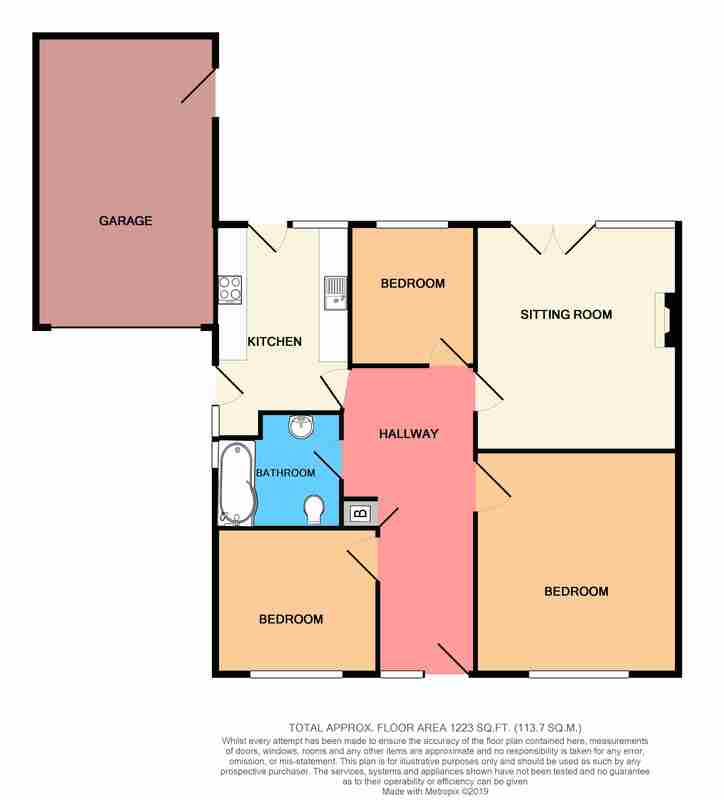 All three bedrooms are double which means you can be versatile with reception space, for example currently one of the bedrooms is a dining room. The bathroom is modern and comprises, panelled ""P shaped" bath with shower over with mains shower. The kitchen is stylish and colourful yet tastefully decorated offering enough space for table and chairs. Outside is simply wonderful, offering purchasers a really superb, private garden with views over looking fields. Laid mainly to lawn with raised areas to soak up the sun, yet ready for a growing family, visits from the grandchildren or simply those that love to garden. The whole benefits from a single garage, double glazing, gas central heating, parking for a number of vehicles and offered with no onward chain. It's a must see! EPC rating D.
DIRECTIONS Coming up Wolvershill road from West Wick, go past the turning for Cook Lane and keep going, Jana can be found on the left hand side. SITUATION The North Somerset village of Banwell is within easy driving distance of Bristol, Weston-super-Mare, Bath, Wells and the national motorway network, making it an ideal choice for the commuter. The village itself has local facilities including shops, pubs, restaurants, churches, primary school and pre-school, with more comprehensive shopping, social and recreational facilities at the above mentioned cities and the coastal town of Weston-super-Mare. Secondary schooling is at nearby Churchill with its associated sports complex and nearby dry-ski slope. The Mendip Hills are close by with an excellent range of country pursuits readily available, including riding, walking and caving, whilst the Chew and Yeo Valleys with the Chew and Blagdon lakes offering excellent sailing and fishing. The long distance traveller has plenty of choice - there are excellent motorway and rail links, whilst Bristol International Airport is just a short drive away. For further information see the Banwell website - www.banwell.info. OUR VENDOR SAYS I love the space and privacy. As a nature lover I enjoy watching the many species of birds in my garden including green woodpecker and great spotted woodpecker! WE HAVE NOTICED The gas fire is on the external wall, which could mean there is the opportunity to add a feature wood burner subject to any necessary checks. There are also houses on the road that used to be bungalows which have been extended into two storey properties. The garden is such a generous size that it lends itself to being a great family house as well as a superb "downsizers" bungalow. The options are there!